As a practice devoted to handling criminal law cases, The Law Office of Richard R. Shaw II in Cheektowaga, New York, has a reputation for obtaining results. 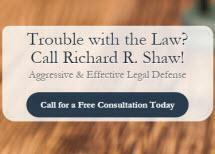 Mr. Shaw has been licensed in the state for almost 20 years. In that time, he has successfully represented countless clients in matters such as juvenile crimes, drug and DWI crimes, traffic violations, assault, white collar crimes and weapons charges. He knows the many ways these cases may affect someone’s future and is proactive in structuring a customized defense against the charges. Former clients regularly voice their positive experiences with this law office. They note Mr. Shaw’s ability to clearly communicate how cases are progressing and what to expect moving forward. Additionally, clients appreciate the personalized attention they receive. Mr. Shaw is a member of the New York State Defenders Association and the Bar Association of Erie County. A licensed real estate agent and certified notary public, Mr. Shaw also handles civil litigation cases that include commercial law, property transactions, estate planning, family law and transportation issues. Mr. Shaw strives to make representation affordable for all clients, even setting up payment plans when necessary. The Law Office of Richard R. Shaw II accepts credit cards and serves people throughout Western New York, including those in Tonawanda, Buffalo, Lancaster, Depew, Williamsville, North Tonawanda, Niagara Falls, Erie, West Seneca, Amherst and Niagara County. Monday - Friday, 7 a.m. - 11 p.m., Saturday - Sunday, 9 a.m. - 10 p.m.